In less than a month, Wisconsinites will go to their polling places to cast a vote in the gubernatorial recall election. If you are unaware, Governor Scott Walker came under intense criticism for a series of bills he supported that weakened unions. Of specific note, collective bargaining rights were stripped from unions. A non-trivial section of the populace, supported by unions from within Wisconsin and from other other states, staged large protests at the capitol in Madison. Additionally, the "Wisconsin 14", fourteen Democrats from the state senate, fled the state to stall passage of the bills. 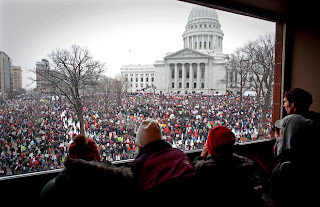 The protests and senatorial hijinks continued for months, with counter-protests forming and the political tone in Wisconsin becoming increasingly venomous and partisan. While I did not return to Wisconsin, I did attend a support protest at Los Angeles City Hall. Even there, the tone was often mocking and negative. When I talked to people back home, I was dismayed by tendencies to demonize and belittle. Even though I supported blocking Governor Walker's bills and maintaining unions' collective bargaining rights, it was painful for me to see my home's political climate, so moderate and civil in my lifetime, turn bitter, inconsiderate, and zealous. My mother's parents were union folks. Her father helped form a machinist's union and both he and my grandmother served as local presidents. My father's father was a shoemaker and a farmer. There were no unions for him. No unions for my father (sculptor) or me (game designer). I'm fine with not being in a union. I'm glad I am paid very well and receive good benefits, but I understand that not everyone has it so easy. I'm glad that unions can be formed and can collectively bargain for rights. I also understand that, like any organization, unions are made of people, and people can be bad. Some unions are terrible, locally and nationally. For me, the issue was never to place unions in a position superior to businesses; I don't think there's anything inherently virtuous about either group of people. I just thought Walker's bills pushed the balance too far. Maybe those who supported them thought they were fine, but certainly they could see why unions exist... right? Certainly those who supported unions could see why some would criticize some union practices... right? This is the state that produced "Fighting Bob" La Follette, and Russ Feingold, but elected Tommy Thompson governor for four terms and historically has a fair split of Democrat/Republican presidential results (excepting 1924, when it went Progressive). We enacted the Wisconsin Idea, La Follette and the Progressives' vision of the UW system working with the government to produce better lives for all Wisconsinites. We've been a state of farmers, cheesemakers, manufacturers, brewers, fishers, and miners. To me, Wisconsinites have always seemed on board with working things out and using common sense. I may have been mistaken. 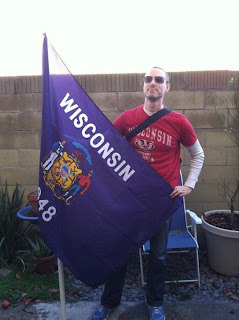 When I visited Wisconsin for two weeks in February of this year, I saw more hostile political billboards, lawn signs, and bumper stickers than I had in the twenty-three years I lived in the state. The recall primary, which took place yesterday, was months away and the protests were almost a year in the past, but people were still mad. Mad about everything. A family friend came over to the house. When he walked in, he pointed to everyone in the room and said, "We're all Democrats here, right? Right?" He was joking, but not really. I don't feel my expectations are too high. I don't expect people not to be mad. I don't expect them not to yell, not to protest, not to rally. I just expect them to not shake and sputter with hate, not to threaten and insult those who disagree with them, not to belittle physical or other personal characteristics of their opponents. Maybe they do that in other states, but not in Wisconsin... right? There's a little less than a month to go before the recall. I support Tom Barrett even though he is not "the union" candidate. I don't feel Wisconsin needs "a union" governor. In my opinion, it needs a governor who understands that there should be a balance between the power of unions and the power of corporations. If you disagree in any way, that's fine. It's all fine. We can talk about it and vote about it (well, you can vote about it, I can pay property taxes and complain if Barrett loses). We can be civil. We can earnestly accept the other side is trying to do the right thing. In the end, I'm less concerned with who winds up in the capitol and more concerned with how the electorate winds up, how we see each other and treat each other. 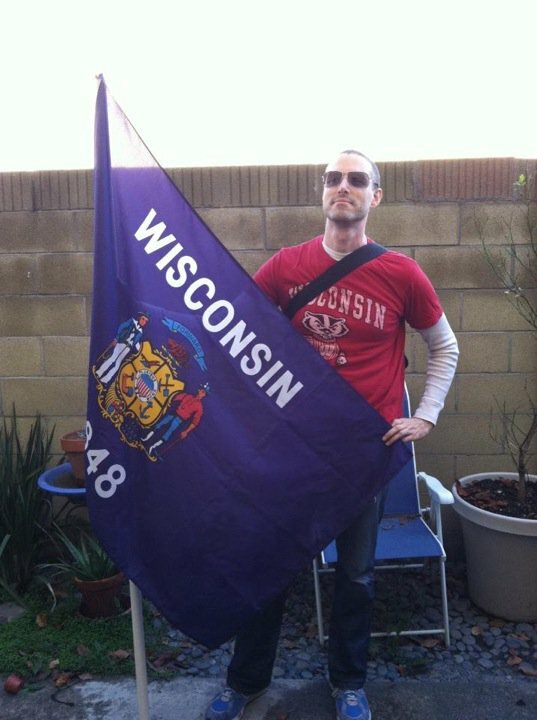 Though I've lived in California for thirteen years, I've always considered Wisconsin to be my home. I don't want it to be just another place where partisans spit fire and tear each others' throats out. Who cares what you think? You can't even drink a beer! AHAHAHAHA! You had to deal with making two Fallout games. Surely that humans act out in these ways or take singular opinions very far shouldn't surprise you? Nowadays, people tend to see local politics as merely "battles" in the National Democrat vs. Republican "war". In the past, people might have been willing to overlook that so-and-so the local politician was from the other side if they knew about him. Now, they see him/her merely as a foot soldier from the enemy camp. Maybe this is because of the internet, or maybe political parties have just got better at ensuring uniformity in their ranks from the top down, but either way, it makes politics very combative. Contrary to the old saying, all politics is *not* local, not anymore. People are acting in the interests of the National parties, not their immediate community. I agree fully with your perspective on this issue. Living in Ohio, I'm in much the same situation in terms of a sudden outburst of partisan fighting in the last few years. It's kind of difficult given my family situation, which involves several union members and several far-right anti-union members. What disturbs me isn't necessarily the hostility, but the sudden need for everyone to latch on to a specific, often radical, political ideology for the sole purpose of acting hostile. This gets to the point where both arguments are clearly irrational, yet both of the people who are arguing seemed fully determined that they are correct, and neither side is willing to budge at all. I believe that the union "side" is far better in terms of their basic argument (wanting collective bargaining), but I'm disappointed in the other people on the union "side" in that they (well, most) don't necessarily believe in the cause because of they like how it will help union workers, but rather they are supporting it as an excuse to latch on to a radical ideology and to scream at the people who are "against" them. One of my family members is a retired teacher, who is only able to be retired at all because of unions, and yet he still latches on to the far-right ideology and adamantly presses on the point that unions are evil and that they "are destroying this country." It just doesn't make sense to me, and I find myself thinking: how did it come to this? I would like to know what led to this sudden political "movement" in our particular states; I'd like to know what caused the sudden need for everyone to cement themselves in a radical viewpoint and refuse to budge, and why it occurred over this particular issue and with these particular leaders. This isn't your local grocery stores unions. Public employee unions are funded by tax dollars and the services they do are government monopolies mandated by law. For them to turn around and use a portion of those tax dollars to advocate for their own economic interest and against the taxpayers is shameful. And to do so in the midst of a recession and after a failed nearly trillion dollar stimulus is doubly so. This has nothing to do with unions and everything to do with ensuring that taxpayers are forced to subsidize economic entities and agendas that run contrary to their own interest and against their will. Ask yourself why teachers need a union and what good it can possibly do students or parents. If you can argue that successfully, well maybe soldiers should have a union too, and if they're unhappy with their pay they can just refuse to defend the United States for a few months. I disagree with most of what you wrote. Education is not a government monopoly, though police forces (mostly) are. Most of the employees of corporations working on behalf of the government (through tax revenue) will attempt to advocate for the best circumstances they can, though those who are not in unions have few options other than to accept the terms of the corporation employing them. I think it's odd to single out public sector unions' collective bargaining rights for gouging WI taxpayers when federal taxpayers have already bailed out a number of enormous financial institutions with little resistance and with gargantuan price tags. "Ask yourself why teachers need a union" Why teachers, specifically? Why not police, or machinists, or anyone else? Do you think that some professions can be taken advantage of and others can't? Do you think that the will of the public majority is inherently more virtuous, less capable of doing harm, than that of a corporation? Because I don't believe that unions are inherently virtuous, just as I don't believe corporations are inherently villainous. I also don't think majority will is inherently virtuous, which is why I think ballot initiatives in California are terrible. I doubt that many people would defend the majority will's if it were that teachers should work for nothing. Similarly, I doubt most people would defend teachers working for millions. I'm certainly not advocating that. I'm not even advocating that specific union demands be met. But without the ability to collectively bargain, workers' unions have virtually no ability to have equal footing with their employers -- public or private. "well maybe soldiers should have a union too, and if they're unhappy with their pay they can just refuse to defend the United States for a few months." Police have unions, and they certainly can go on strike. If the politicians and agencies representing the public insist on treating public employees like garbage, I fully believe that those employees should be able to collectively bargain and, if they feel they need to, collectively strike. If the United States treats its armed forces like garbage, why should soldiers not be able to organize and bargain for better conditions? We have a bizarre love/hate relationship with our armed forces, spending billions on equipment, lauding those who serve in the abstract, and often neglecting individuals when they return home. Unions aren't the problem. Corporations aren't the problem. Our financial situation is the problem. Solving it is more complex than breaking the spine of one side involved in the labor/capital relationship. "Police have unions, and they can certainly go on strike." Actually, police officers cannot go on strike. They will be charged criminally for dereliction of duty. The same goes for if multiple officers try to quit at the same time as a form of protest. So basically, if police officers lose collective bargaining... well, it's bad. I know police are explicitly barred from striking in some states, but even so, sometimes they still do. To advocate that essential public services including national defense will only be provided if the union feels its in their financial best interest to do so is one of the most dangerous ideas I've heard in my entire life. I thought you would define a limiting principle for collective bargaining but you swallowed the bait and now I'm kind of sorry you did. Feel free to scrub this and the above if you have a change of heart. "...is one of the most dangerous ideas I've heard in my entire life." ^Yeah, that sums it up. Anyways, I don't think you understand what unions are, and I don't think you know what collective bargaining is. Unions do not control the police force, the firefighters, or the teachers. They just make sure that they have rights. Do they take their union fees and use them to back political causes? Yes. Is that good? No. But it's better than having public employees who work for next to nothing. Unions are made of people, and the issues for which they negotiate go beyond pay. They have historically involved issues of pay, safety, work hours, medical benefits, and all sorts of other things. They have also historically been met with threats of violence and actual violence by corporate and government forces. For example, the Bay View Massacre on May 5th, 1886 in Milwaukee. Also, many voluntary members of the military to whom I have spoken have expressed a belief that their terms of service were a) misleading or b) not followed through on. These claims range from promises of compensation to promises of assignment. It has also taken the government a shocking amount of time to acknowledge PTSD and offer support for it. There are still a huge number of veterans and serving members of the military who have claimed that to admit to any sort of psychological difficulty while serving is tantamount to ending one's service career. Do you think this is acceptable? Do you think the government or the military will just "fix it" on their own when it's been going on since time immemorial? The VA/VHA is the best thing veterans have, but that doesn't apply to men and women serving in the field. If the most dangerous idea you've heard in your life is that these men and women could collectively say, "Nah, that's not acceptable and we're not putting up with it anymore," I don't think you've heard many dangerous ideas. Most juntas aren't given permission to take over. "Of specific note, collective bargaining rights were stripped from unions." Collective bargaining rights nowadays is an euphemism for "do business with our cartel or do business with nobody". It is a good thing that they were stripped. Nobody should be forced to negotiate. There are hundreds of unions in the united states, ranging from sanitation workers to teachers to coal miners. Do you think it's reasonable to equate the actions of the worst unions with all unions? That's as bad as equating the actions of the worst corporations with all corporations. More importantly, it doesn't actually solve any problems unless you literally have no concern for the balance of laborers relative to their employers. Without collective bargaining rights, no one will be forced to negotiate because there won't be any leverage for labor to use against corporations. I.e. labor will simply have to accept whatever terms are dictated to them by corporations. In that case, only labor laws, which often fail to account for the specific issues of individual professions, stand between the corporation and employees. Many of the people who oppose unions also oppose labor legislation. I don't know if the people who hold these views either don't realize that the absence of both these things effectively puts us back to late 19th-century working conditions or if they do know and think that's a good thing. The Upper Big Branch explosion happened only two years ago. Massey Energy had been previously cited and fined for their violations, but the conditions continued and eventually resulted in a tragedy. The government isn't the answer to every problem, and unions certainly aren't the answer to every problem (both often cause plenty of problems), but the fact is that a lot of labor problems exist that a competitive marketplace will not fix on its own -- especially in regions where one company handily dominates an entire industry. If you want to reform laws about unionization, you'll hear no arguments from me. I think there are a ton of terrible unions out there, or at least unions that have leveraged so much power that they are now strangling the corporations that employ them. That is a subset of unions. I don't think the solution is to break the spine of unions unilaterally. It may knock the abusive unions down a peg or two, but the ones that are still struggling to achieve some balance of power get slammed in the process. One more thing for anyone to read up on if they are interested in the historical dynamic of military veterans organizing is the Bonus Army. They weren't a union, but they organized and acted in a similar way. They were also treated similarly. When you say "treated similarly", how far do you extend the analogy? Do you mean just the brutality of Hoover's administration against them, or also the subsequent receptiveness to their grievances from FDR? I ask because it kind of mimics (in microcosm) the fortunes of organized labor in this country. My $0.02: the initial treatment of the Bonus Army was instigated primarily by the often-rebellious and aggressive Douglas MacArthur. It was a huge P.R. disaster, and no savvy politician would ever have endorsed it. However, it doesn't quite address the central problem theoretically posed by a unionized Armed Forces: the "we won't fight till we get a raise" problem. But having said that, I can't imagine that being much of a problem. The people I know in the military are not the sort to behave like that--they would put their duty first. I wonder why some seem to think teachers etc. would do otherwise. The biggest problem I see with an armed forces union is actually an internal problem--specifically given the importance of rank to the functioning of a military unit, how would you prevent someone's rank in the Union from conflicting with their rank in the military? After all, the ultimate commander of the military is the President, who is also responsible to the taxpayers who pay the military.